One day, after Jesus was with the crowd for the whole day and sent them away, He made his disciples got into a boat to go to the other side to Bethsaida. Then Jesus climbed up to a mountain and pray by himself. At evening, the boat was at the middle of the lake. Jesus saw His disciples were straining at rowing the boat because the wind was blowing against the direction where the boat is going. At midnight four o’clock, Jesus decided to walk over the lake to reach the other side. He was about to passed by his disciples when they saw Him. The disciples were shocked. They thought that a ghost was walking on the water. They grew afraid and cried out. 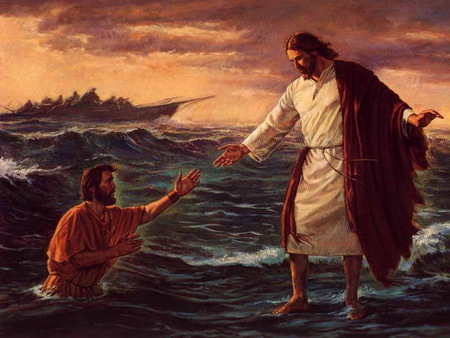 Jesus held out his hand and caught Peter up. After that, Jesus and Peter got into the boat and the wind stopped blowing against them. His disciples were amazed and marveled at each other.